In the middle of the city we create a social, rural place where everybody gets together. 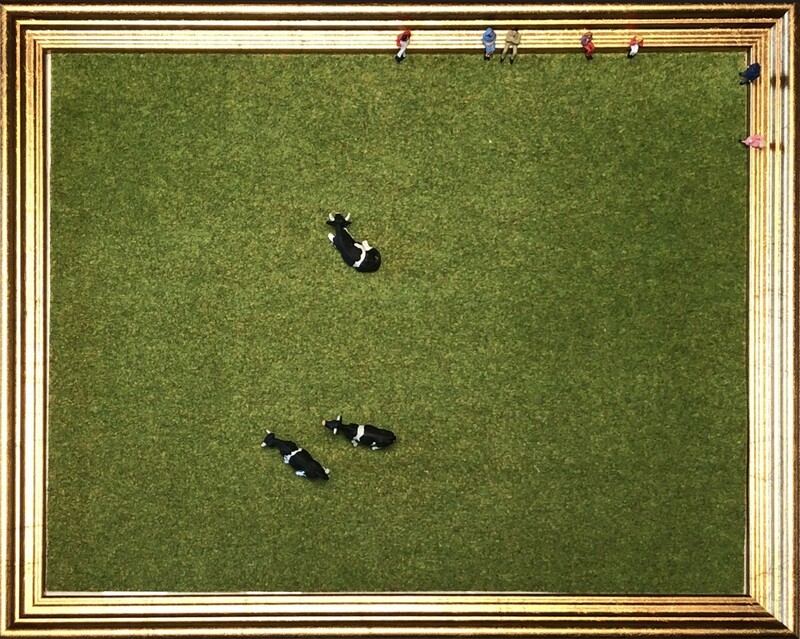 The image has a soothing, calming effect and cows are pieceful and majestic animals to watch. The work investigates our relation to animals, and the livestock industry in particular. The classical bucolic tableau allows you to linger safely in esthetic bliss. However, we here make the painting into a reality and we invite people to take a stand. Lastly, the work has a meta-edge to it. Art is looking to renew itself. The representation is exhausted. How can you find a new and compelling way of portraying this classical image? Do we need to get rid of representation to get to realism? Is the new form to be found in a different relation between fiction and reality, between representation and the real thing? These kind of talks take place on the gilded benches. While the children caress the cows, the adults question their own frame of mind.